A strong performance in total asset standing at 44.4 billion QR, driven by a strong growth in the finance portfolio that exceeded 27.8 billion QR. Customer deposits reached 26 billion QR. 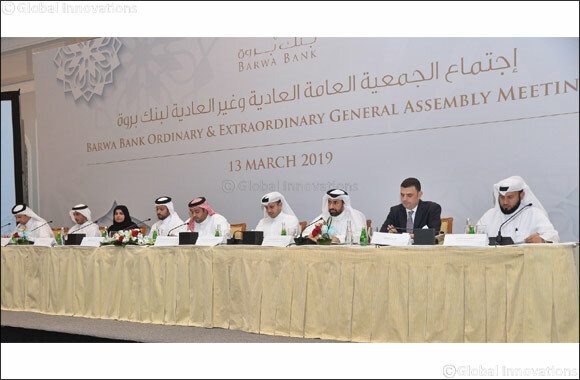 Doha – Qatar, 14 March 2019 - Barwa Bank Group, convened its Annual General Meeting (AGM) and Extraordinary General Meeting (EGM) on 13th of March February 2019 at Four Seasons hotel, chaired by HE Sheikh Mohamed Bin Hamad Bin Jassim Al Thani, Chairman of the Board and Managing Director, with an 87% shareholder attendance. During the AGM, all items on the agenda were discussed, such as hearing and approving the Board's Report for the year that ended December 31, 2018, as well as discussing and approving the group’s future business plans. This also came in line with the approval of the Board’s recommendation to distribute cash dividends amounting to 15% of the nominal value of the shares at the rate of QR 1.5 per share, along with the validation of the External Auditor's Report of the year ending December 31, 2018 and discussing the bank’s balance sheet for the year, including profits and losses. The Assembly agenda also included discussion on the report of the Shariah Supervisory Board, approval of the 2018 financial statements, as well as approving the Board of Directors remuneration, along with the appointment of external auditor and their fees for the financial year 2019. The new Board members were elected for the 2019-2021 term; HE Sheikh Mohammed Bin Hamad Bin Jassim Al Thani, Mr. Abdul Aziz Mohammed Hamad Al Mana, Mr. Sultan Yousif Al Sulaiti, Sheikh Jassim Bin Fahd Bin Jassim Al Thani, and Mr. Nasser Ali Al Hajri. During the assembly, the representatives of the General Authority for Retirement and Social Security were also appointed; Ms. Moza Mohammed Al-Sulaiti, Mr. Ahmed Abdul Razzaq Al Hashimi and Dr. Ahmed Mohammed Al Mana, in addition to the appointment of Sheikh Khalid bin Hassan bin Khalid Al Thani as representative of Qatar Holding. The Shari'a Supervisory Board has been appointed for the next three years (2019-2021) renewable under the chairmanship of Sheikh Dr. Walid Bin Hadi, Sheikh Dr. Osama Al Durai, Executive Member, and Sheikh Dr. Essam Al Anzi, member of the Board. H.E. Sheikh Mohammed Bin Hamad Bin Jassim Al-Thani, Barwa Bank’s Chairman and Managing Director, presented a detailed report on the bank’s activities and financial results, highlighting the most important results achieved by the bank in 2018. The Group recorded strong growth in each of the financial position and profits, as the net profit for 2018 rose to QR 765 million and earnings per share reached QR 2.58. These results were actualized despite the challenges faced banking sector in particular, and the overall market. Such perseverance came at a time during which the economy faced a liquidity freeze, along with an increase funding costs and the challenging decline in oil prices, during which Barwa Bank Group was able to maintain its profitability. In addition, the focus in 2018 was directed to consolidate the bank's foundation in the local market and to maintain its market share, while also maintaining asset quality and risk management policies. The Group has worked on controlling and rationalizing the cost base and the adoption of a work structure that is marked by quality, flexibility and efficiency. On the Qatarization front, the board of directors shows firm belief in the importance of human capital, which is considered the main factor in the Group’s success and its ability to achieve its goals. Continued efforts are being poured into attracting practically and academically qualified Qatari youth talent to assume their role in leading the Group and bring it to front ranks among Islamic financial institutions. Regarding future plans, Sheikh Mohamed Bin Hamad Bin Jassim Al-Thani, Barwa Bank’s Chairman and Managing Director, mentioned that due to the national economy’s provision of promising opportunities and an investment climate that is comparable to the major economies, the Group will spare no effort to gain the largest possible share of financing infrastructure projects and providing all possible support to contribute to the growth of the country's economy. The Group will also continue, by all means, working to increase shareholders returns through an expansion in activity in the State of Qatar. As such, the decision to merge with Qatar International Bank was taken as one of the strategic mechanisms to expand and grow, moving towards a promising future and taking Barwa Bank's positioning to the next level as the fastest growing banks in the region. Following the meeting of the General Assembly, the Board of Directors held its meeting. His Excellency Sheikh Mohammed Bin Hamad Bin Jassim Al Thani was elected Chairman of the Board of Directors and Managing Director. Mr. Abdul Aziz Mohammed Hamad Al Mana was elected as Deputy Chairman of the Board, and Mr. Talal Ahmed Al Khaja was appointed Secretary of the Board. In addition, the formation of committees emanating from the Board of Directors was approved, with determination of its tasks and responsibilities. The distribution of the dividend checks for the fiscal year of 2018, beginning from 17 March 2019, will take place during official working hours, at the Barwa Bank main branch located at Grand Hamad Street. At which point their dividends will be deposited directly in to the shareholders accounts, listed on the Barwa Bank shareholder register.